Singer/guitarist Jerry Roberts will entertain you with his eclectic mix of jazz, blues and reggae. A Cutter is the traditional Bajan sandwich: a hearty salt bread roll with a healthy serving of flying fish, ham, or New Zealand cheddar, to name a few favorites. 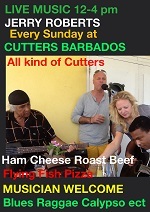 Add to these ingredients a country store with easy deli, wines, and peaceful music, and you've found Cutters of Barbados. Come out and sing, play along or just come and enjoy. Music selections from your favorite Crop Over songs! Pass the Crane Hotel on your right and Cutters is 150 yards further along on your left.